One of my favorite parts about living in Vermont is our ability to defy description, particularly at a time when it has become acceptable in our country to separate and label entire groups of people, placing them in boxes based on beliefs, actions, or appearance. I am proud to live in a brave little state full of hyphens. What do I mean by this? Simply that we don’t summarize our fellow citizens using one-word labels. To capture the complex character of my friends and neighbors, I often find myself assembling beautiful run-on sentences that would make my high school English teacher cringe. I introduce my neighbor as the hunter-farmer-outdoorsy-blacksmith-birder. When describing my friend, I call him an artsy-mechanic-logger-dad-artisan-quarry worker. As for me, I am a hiker-engineer-occasional angler-mom-paddler-conservationist. A lot of hats for certain, but no more (and quite possibly a few less) than most other Vermonters. Being able to respect our differences while working alongside one another to maintain the health of our wildlife, woodlands and waterways, and still preserve public access, is one of our most important responsibilities. And one that is easiest to accomplish when we don’t let labels stand in the way of shared purpose and good work. Hunters are common in the autumn woods of Vermont. Just because hunting seasons have started doesn't mean other recreationists need to stay away from the woods.' ﻿ Here are a few suggestions to safely enjoy the outdoors this season. Marcescent leaves may deter animals like deer from eating twigs and nutritious buds. Dead, dry leaves make the twigs less nutritious and less palatable. By holding onto their leaves until spring, trees are able to deliver a boost of rich fertilizer right when they need it the most. Not all marcescent species' leaves decompose well. Letting them hang on longer may increase photodegradation, improving decomposition rates when they finally fall off the tree. Remaining leaves may help the tree to trap snow in winter. By collecting additional snow, trees can provide more water for themselves in spring. Speaking of woods, I recently stopped by Long View Forests in Westminster to see an active logging operation. Long View is one of Vermont's most progressive forestry management companies, performing forestry services, logging, site work and excavation in the Connecticut River Valley. 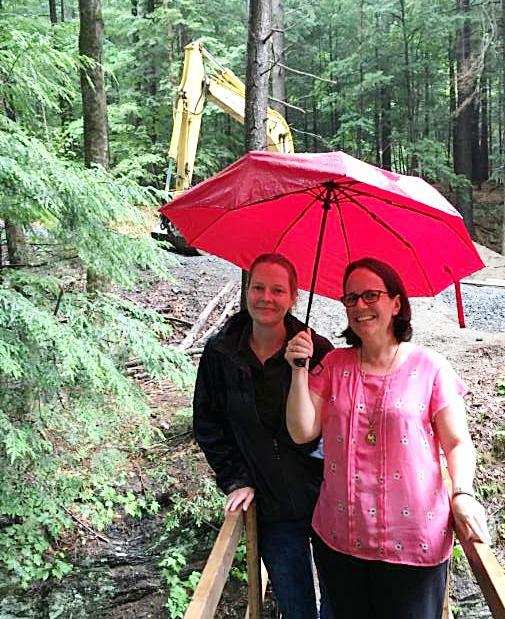 It was incredible to see the high-tech, modern tools they are using like the “cut to length” logging systems and the level of sustainable forestry management practices they embed into every aspect of their operations. ﻿For some, seeing loggers cutting down trees in local wood lots can seem counterproductive to forest health, but the truth is, smart forest management can create a more resilient forest by diversifying both the type and age of trees in a particular stand. Timber harvests are also an essential part of Vermont’s forest economy, and our working forests help keep Vermont’s Green Mountains green. Want to know more? Check our Department of Forests, Parks, and Recreation’s forest economy efforts . Seven years ago, Vermont lost one of its most important historic sites; its oldest fish hatchery. The Roxbury Hatchery , originally built in 1891, was wiped out during Tropical Storm Irene. Today, it's being restored and will reopen to the public in 2020. This article dives into the reconstruction process and outlines how hatcheries help strengthen native fish populations. This month, I had the privilege to attend the bi-monthly meeting of the Windham Regional Commission (WRC) in Brattleboro to learn more about the ways WRC supports towns throughout southeastern Vermont. There so many intersections between the work of Regional Planning Commissions (RPCs) and Agency programs and staff. From thinking about forest integrity, to developing a regional energy plan, and supporting the redevelopment of brownfield site into vibrant, active community centerpieces – RPCs play a vital role informing, extending and amplifying ANR’s work at the local level. Join me in Montpelier to discuss a variety of environmental topics on Tuesday, November 27th. The conversation will start with a discussion on invasive species in Vermont. I'll open the floor to the public, inviting you to share thoughts, ideas, questions and concerns about Vermont’s natural world – from land and water to plants and wildlife. The gathering will be held in the Dewey Building at 1 National Life Drive in Montpelier on November 27 th from 4:00-5:00pm. For those not able to make it in person, a Facebook Live stream will be available on ANR's Facebook page . Emerald ash borer (EAB) is a destructive and invasive forest pest that feeds on and eventually kills all species of ash trees. Communities statewide are encouraged to prepare for the impacts of the pest. This training, led by staff from the Vermont Urban & Community Forestry Program, is intended to teach participants about EAB, introduce planning and management strategies, and to give an overview of the resources available to help towns assess risk and establish a plan. The Clean Water Board allocates Clean Water Fund dollars each year following a budget process with multiple opportunities for public participation. Your participation in the Clean Water Fund budget process will help the Clean Water Board better understand public priorities for funding clean water improvements in Vermont’s lakes, rivers, and wetlands.